Four more years of creeping Socialism from a second Obama presidency has redoubled efforts by many preppers who fear the worst. They are purchasing guns and ammo, stocking up on dry goods, and making financial preparations in case of an economic crisis. Many individuals are signing up for Jason Hartman’s Meet the Masters of Income Property Investing from January 18th through the 20th. The conference will allow you one-on-one discussions with top financial analysts that can help you make the most of your rental property investments. 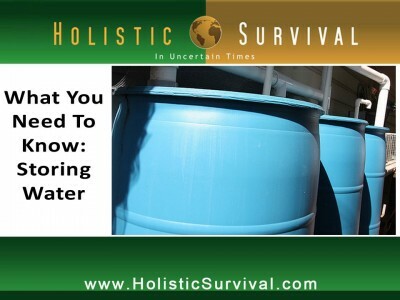 If you are a relative newbie to prepping, you may know that a two-week emergency supply of water should be kept, which should consist of at least fourteen gallons per person for the purposes of drinking, cooking, and cleaning. However, you may not realize that filling old Coke bottles or milk jugs with water may not always be the best idea in an emergency situation. First of all, you would need 112 two-liter bottles for a family of four, and most real preppers plan for more than that – as much as a month’s supply of clean water. Secondly, it’s not a good idea to use clear beverage bottles. Invest in the barrels that range in size from thirty to fifty-five gallons. Or at least purchase some five gallon jugs. These are better equipped to store water with their thick plastic and sturdy construction. When filling your containers either fill straight from the tap or use a white hose, which is specially made for drinking purposes. Other hoses may contain lead. Place the barrels off the ground, such as up on a wooden pallet, to prevent the leaching of lye or other chemicals into your future drinking water. Be sure to place the barrel where you intend to store it prior to filling it, because once full, you’ll have a hard time moving it due to the added weight of the water. Another issue with using plastic bottles is that over time, they will take on the odors around them, absorbing them into the flavor of the water with sometimes toxic results. For instance, if you store your water in the basement near your partially used paint cans, your water will not only taste like paint, it could very well have the poisonous chemicals in it. So rotate the bottles, moving them from basement to garage to the trunk of your car every three months. Be sure to properly treat and test the water before consuming it. There are various ways to do this from using chlorine (not Clorox bleach) to boiling to adding certain items, such as iodine or Aerobic Stabilized Oxygen.